While we were pretty much fully informed about the announcement of the Nexus 7 and Android 4.3 at Google's media event today, Chromecast was indeed a nice little surprise. Chromecast is another way to bring online content to the entertainment center of your home, which for many people is the television hooked up to high-end surround sound equipment. Chromecast is not a replacement to Google TV, it is simply an alternative to bring all sorts of great media to the family room though, and at only $35, not only is it appealing for your own home, it makes an easy gift idea for family and friends (a perfect stocking stuffer right?). Chromecast does not require a remote, only configuration with your router and once that is complete, your iOS or Android device can do the rest of the work as well as any Chrome browser (Mac, Windows or Chromebook Pixel). One thing that you need to know is that you are not channeling content from your device to your TV. Instead, you are directing Chromecast where to grab the media directly and that not only allows for full HD video delivery, but also saves the battery on your smartphone, tablet or laptop. All you do is plug it in, connect Chromecast to Wi-Fi and start cast content. Three steps and yes, it is that easy. Another cool part about this is that since Chromecast handles the media connectivity, this allows you to continue using your smartphone or tablet for other work, multitask away with email or phone calls. At $35, Chromecast is a pretty easy buying decision and its integration with apps most people use every day like YouTube or Netflix is already in place, plus it is in beta for the Chrome browser, so the internet is at your TV's doorstep. A lot of other media providers are developing it for their apps as well so you are sure to find more and more venues to use it with. That is absolutely amazing. 4.3 looking amazingly smooth too, look at this thing blow through 1080p with only an S4 Pro. Google doing a good job with OS optimization hopefully it continues into popular apps. this is an amazing cheap device to link tablet devices to tv. i can easily see apple tv google tv samsung and lg and other tv manufacturers iteriations becoming obsolete so simple and it works. now all that stands is program support. like amazon streaming! The Google TV devices may slip by the wayside, but Apple TV still has a huge advantage, besides all of the little things it does with Apple devices like screen mirroring, over it: Chromecast doesn't actually stream anything. You can't stream local content, so all of your stored movies and music are useless with it. Mark my words.. What u just said it cant do, will be better 2nd time around. google will make a chromecast(S) Lol. the s4pro and the s6 series have very litle differences. wait, can I stream media from my device if I wanted? or just point it to data I could already access using an xbox or ps3? No. It only fetches a URL for content that your device points it to, it doesn't actually stream anything. no can It play media from my device or just internet videos? Looks like smart TV's are going to become obsolete! This will be so much easier to use, update, and sell than a giant super expensive tv! Way to go Google! I'm thinking the devs at xda will figure it out before google. If it can stream 1080p it can certainly handle screen mirroring. I like this thing. Hopefully app devs will utilize it. This is very cool. 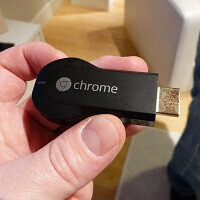 @ Maxwell R. do u know if the Chromecast will be able too play regular videos on Android device besides Netflix? Like too know thanks. We will have a couple more demo video from a couple developers already integrating Chromecast features into their apps. While the end user funcationality is insanely simple, the Google design team told me it was quite tricky from a developer perspective because of the end user experience. What? You do realize that this thing only goes to where you point it, like urls. Viewing habits? What viewing habits, your web browsing habits? Good grief! I don't know why they did not include miracast, as the nexus 4 on android 4.2 supports this already I would not mind paying extra for it. However this is a great start especially because of the price and cross platform I just hope it's comes to other countries soon!